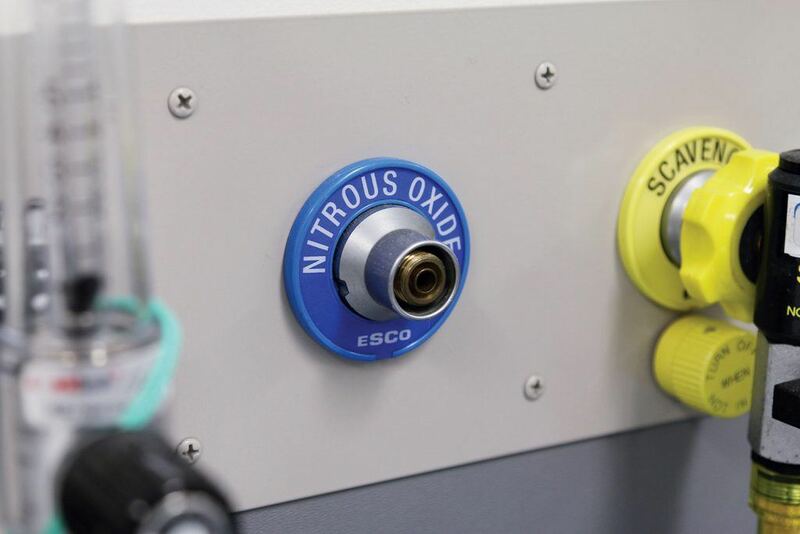 ESCO Medicon is one of the largest manufacturers of Medical Gas product in Australasia. The range is extensive covering gas terminal units, isolating valve boxes, low pressure hose assemblies, NIST lines, alarm panels, gas manifolds, surgical tool control panels and tourniquet control panels. Outside of hospitals, medical centres and other healthcare facilities, the range is also suitable for various other applications including Laboratories, dental clinics and veterinary clinics and complies to a number of standards including Australian and British. 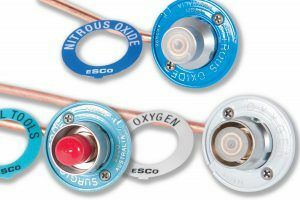 ESCO Medicon Isolating Valve Boxes are ideal for all modern medical applications. Designed to meet and exceed the strictest medical standards, our valve boxes can be customised for any facilities or requirement. 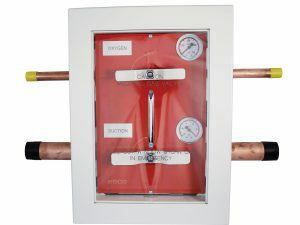 Each ESCO Medicon gas valve box assembly is designed to allow for gas sampling, purging, emergency supply connection & testing. Gas type & valve handle orientation can easily be determined or identified at a distance through a clear polycarbonate safety cover (window) which also allows for the handle to be in any position. Each box is fully Galvanised with an exterior finish of Polyester Powdercoat. Front surrounds are supplied to suit varying wall surface thickness and feature front (pull-out) Polycarbonate access windows that allow operation of the valves in the open or closed position. The standard unit colour is off white. However, if additional colours are required, we are able to provide this service at an additional cost. ESCO Medicon low pressure flexible hose assemblies are designed for gas distribution in Hospitals, Dental Surgeries & Veterinary Clinics. 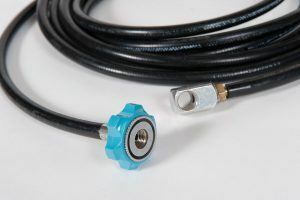 The hose assemblies are available in many different styles and combinations, customised to specific user specifications. ESCO Medicon Automatic Gas Manifold (AGM) systems are designed to supply Healthcare facilities with medical gases, meeting the requirements of AS2896-2011. At the heart of an AGM is the central console. The function of this console is to simultaneously reduce the cylinder pressure to final line feed pressure and changing the cylinder bank when the primary bank falls below the useable line pressure. ESCO Medicon – Surgical Tool Control Panels are available in a variety of configurations.. The panels are designed to provide variable medical air to a surgical tool medial gas outlet on the panel with optional feeds to a remote terminal outlet or surgical service pendant. ESCO Medicon Tourniquet monitor panels are designed to set tourniquet pressure applied to two (2) independent tourniquet systems. The device monitors the pressure and sounds an alarm (both audible & visual) should the pressure rise or fall outside of preset limits. ALARM08 – capacity of monitoring up to eight (8) x input signals. ALARM24 – capacity of monitoring up to twenty-four (24) x input signals (typically used at workstations, with remote panels being the eight (8) x input option).